Sunday June 5th 1892 I was busy about the work all forenoon. Mother went to church and did not come home till evening. I wrote letters all the time I had to spare. Will spent the afternoon over to Marys. We sat on the poch in the evening. Monday June 6th 1892 Mother and I worked out in the garden some this morning and fixed the chicken yard. After dinner I finished my new calico dress and Mother fixed a dress for herself. We put out tomato plants after supper. Tuesday June 7th 1892 We washed and ironed today besides doing sweeping and baking. After supper I put out cabbage plants. I was very tired and went to bed early. Will finished plowing corn. Wednesday June 8th 1892 Mr Ables friends came on an early train this morning. After breakfast Will took me over town in the buggy to get some things. I sewed in the afternoon. I rode over after supper I was down to Hatties and stayed with the children awhile. 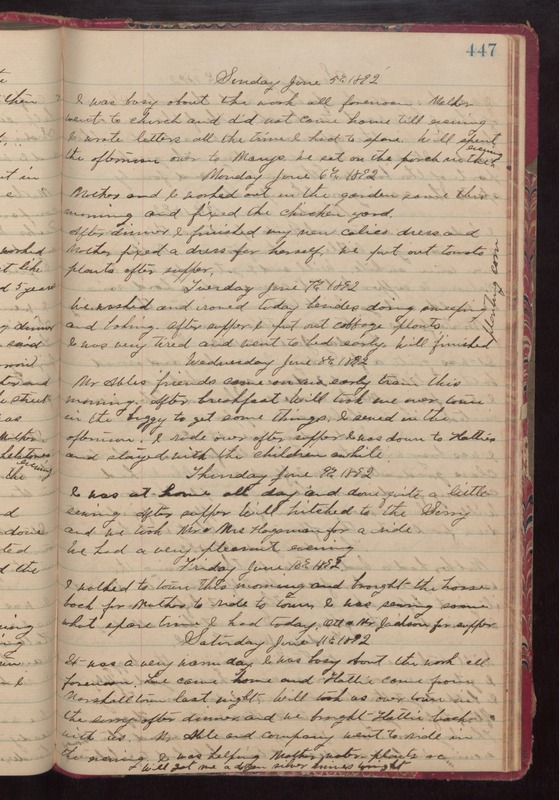 Thursday June 9th 1892 I was at home all day and done quite a little sewing. After supper Will hitched to the Surry and we took Mr & Mrs Hagaman for a ride. We had a pleasant evening. Friday June 10th 1892 I walked to town this morning and brought the horse back for Mother to ride to town. I was sewing some what spare time I had today. Ott & Mr Jackson for supper. Saturday June 11th 1892 It was a very warm day. I was busy about the work all forenoon. Lee came home and Hattie came from Marshalltown last night. Will took us over town in the surry after dinner and we brought Hattie back with us. Mr Able and company went to ride in the evening. I was helping Mother water plants & Will got me a dozen silver knives tonight.